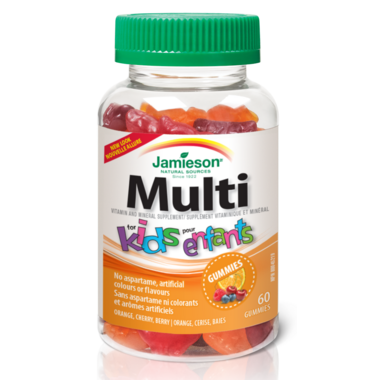 Jamieson Multi Vitamin and Mineral Supplement for Kids contains 100% or more of your daily required vitamins in 1 gummy! 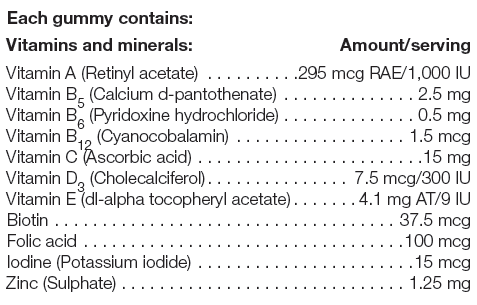 The multivitamin is formulated in accordance with Health Canada’s Recommended Dietary Allowance (RDA) guidelines for daily nutrient and vitamin intake. 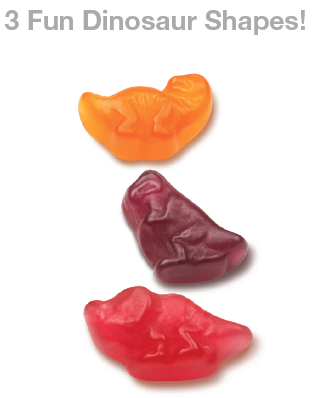 Directions – Children 3 years and older: Chew 1 gummy daily with a meal. Store between 15°C and 25°C, away from children. Also contains: Gelatin, glucose syrup, sucrose, citric acid, lactic acid, natural flavours (orange, cherry, mixed berry), natural colours (annatto extract, purple carrot juice, maqui berry), fractionated coconut oil, beeswax, Brazilian palm tree wax. My 4 year old daughter loves these vitamins. She eats them without complaints. Wondeful choice for kids with allergies as we can avoid major allergens. Wish the shapes were maybe more farm animals? We are not fans of dinosaurs in our home but she eats them regardless because the flavor is great. We've tried different multivitamin brands, but this one is the one my kids like the most. The gummies taste great, and the price is reasonable too. Was searching for a vitamin for my girls without artificial food dyes and I found it! They love these, taste good and the price is great. My kids have tried other gummy vitamins but these are the only ones that they are excited to take. Unlike other brands we've tried, I like that they only need to eat one per day. My kids love these and have no problem taking them. Thank god for these! My daughter loves these, likes to figure out what dinosaur she got! Tastes good too!